Whether you’re trying to get an inside mark rounding, clear wind at the start of a race, gain height on the windward leg or get better headsail trim, these expert racing tips are extraordinarily useful. Take your Bradenton yacht out for a quick race and see just how much better you can be with these quick tips! Learning to read situations as they develop comes naturally through practice, but with some expert advice, you’ll be a professional before you know it. The benefit of getting your surfing technique right is best measured when there’s a comparable boat nearby. But knowing what to do, how much and when is equally important. Working up a personal checklist for each type of mark rounding will decrease the need for the large amount of requests from the afterguard right when the pressure is on and develop the ideal working environment: a quiet boat. With so many variables during a race, teams that deal better with fluctuating wind strength, dirty air and rough seas will sail a lot smarter. Recording the effect of alterations to rig tension and a precise set of target boat speeds will help the mainsail trimmer, but establishing a good rapport with the helmsman and headsail trimmers should lead you to delivering great performance. Spinning out to leeward or what is known as a crash gybe or Chinese gybe can often be avoided. Here are five tips to get your boat under control. Knowing when and why to take a penalty can get lost in the heat of competition. Jonty Sherwill asked experienced Solent racer Paul Heys for his 5 tips on staying afloat and getting back under way when you’ve run aground. Designers work hard to create fast yachts, but much can be done to optimise a boat’s IRC rating. Jonty Sherwill asked measurement experts for their 5 tips. Getting good starts is far from easy and the bowman’s role is crucial. Sailing to win – how to win a race and ensure you cross the line first. Although not many boaters out there that own a Bradenton Yacht will be racing, it is always great to have these in the back of your mind in case you ever do happen to find yourself out and about in the midst of a race. 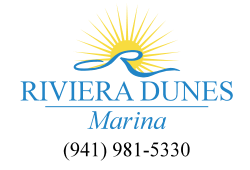 Of course during the down time, feel free to stop by your favorite Bradenton Marina, Riviera Dunes Marina. Shark Week is a popular program on the Discovery Channel and now Southwest Florida residents can get excited about it. Shark Week is a week where fictional and nonfictional shark-themed shows air. “Tiburon: The Sharks of Cuba” aired during Shark Week which presented the findings that Sarasota’s Mote Marine Laboratory and Aquarium found during research that they conducted on Cuban sharks. The Center for Coastal Ecosystems Research, the University of Havana, the National Center for Protected Areas and the Ministry of Food’s Office of Fisheries were the organizations from Cuba involved in the project. Those who participated in the expedition with two representatives from the Environmental Defense Fund, a U.S. nonprofit that works for environmental preservation included Drs. Robert Hueter, Kim Ritchie and Dave Vaughan, senior biologist Jack Morris and associate researcher John Tyminski from Mote. Satellite transmitters were placed on sharks in Cuban waters by American and Cuban scientists for the first time. They managed to place a transmitter on a rare longfin mako shark so that they could track its patterns and movements, among other accomplishments. The transmitters generated data in the months that followed. Conservation and environmental research is important for Florida’s top industry, tourism. In particular, “ecotourism,” or traveling with a focus on sustainability, minimizing impact and viewing wildlife in natural areas, this is especially affected by dwindling sea and land animal populations. Taryn Daley, a travel adviser for Admiral Travel states that tourism and conservation go hand-in-hand and help to create a healthy ecosystem for all to enjoy. She also states that a huge part of the tourism market are people that are looking for tropical and resort vacations where they can whale watch, scuba dive or snorkel. However, shark-population peril can affect the way the rest of the underwater viewing experience is seen. Tourists probably do not want to get close to sharks while they scuba dive or snorkel. Daley states that sharks are an important part of the ecosystem and if one species gets drastically affected then it can affect everything around it. Cuba was chosen for Mote’s shark research because of its near-perfect ecosystems and amount of unsolved scientific mysteries. The health of an underwater ecosystem is paramount to ensuring a region remains competitive within the tourism market because of the abundance of coastal destinations and vast oceans. More than 10 years ago, Mote scientists began traveling to Cuba to collaborate on research based in the Gulf of Mexico. Mote is an independent nonprofit so that means it was not subject to as many Cuban travel restrictions as other U.S. entities. Cuban partner Jorge Angulo Valdes, director of conservation at the University of Havana’s Center for Marine Research states that if we want to preserve our shared resources, trustful collaboration is the way to go. This expedition showed how important collaborations are and how much you can accomplish by collaborating. The research conducted between U.S. and Cuban partners is building knowledge to help restore shark numbers worldwide because shark populations have dwindled in the past 40 years. Daniel Whittle, Cuba Program director for EDF stated that they don’t want sharks to disappear and that their long-term goal is to improve international cooperation, science, management and the exchange of expertise. This could lead to the recovery and long term health of shark populations. It is very exciting to see a week as big as Shark Week featuring a local favorite right around our Palmetto Marina! Your first point of contact is your charter broker. 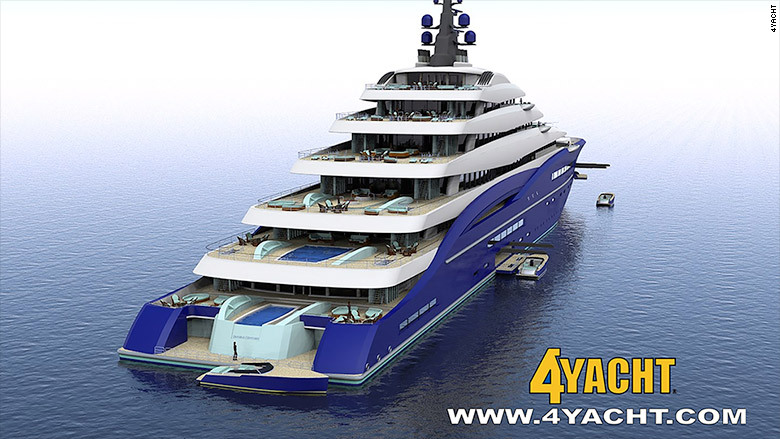 You’ll be assigned one as soon as you contact a yacht-charter company. He or she is the genius who will find the best yacht for you. She’ll quiz you on your requirements, such as destination, interests, and traveling desires – and then present you with a selection. A fantastic broker will also haggle on your behalf to get the best deal. Chartering isn’t cheap, but it can be surprisingly affordable. Oftentimes, the price of chartering a boat for one week is comparable to spending a week in a five-star resort. Finding the best Palmetto yacht though is the tricky part as there are plenty of good ones to choose from at our Marina. Don’t plan on dressing up. Yachting is extremely casual, and you’ll be barefoot the entire time – no shoes allowed. Treat yourself to a pedicure! They come with your Palmetto Yacht, and repeat customers will often choose a yacht again and again because they love the crew. The bare minimum of staff is three: a captain, a steward (who will double up as chef) and a deckhand. The bigger the boat, the more people on deck. Specialist members such as nannies or massage therapists usually cost extra. The crew signs confidentiality agreements and there are social-media blackouts in place. What happens on the yacht stays on the yacht. With that being said, be considerate of the crew. Most Palmetto yachts now have stabilizers, both while cruising and at anchor. This means the boat won’t rock and roll on rough waters, and you won’t be thrown around the boat. There’s no solid rule, but the norm is between 5% and 15% of the value of the charter, split between the crew. Yachts are perfectly safe for kids, even babies – everything is secure, and there are proper precautions to prevent accidents from happening. Dogs, on the other hand, are frowned upon. If yours is very small and well behaved, your broker might be able to work out an exception. At the end of the day, make sure you have a great time as your Palmetto Yacht experience is only as good as you make it. 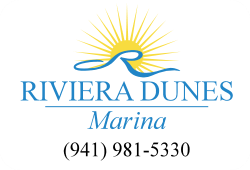 Enjoy the sea life and stop by Riviera Dunes Marina any time to keep your yacht safe and sound! 2. Have a float plan. Tell someone where you’re going to be and when you plan on returning. Turn on VHF Radio and select Channel 16. These are just a few of our main tips when out on your Palmetto boat. The best time you can have when out on the Manatee River is a safe time and with the summer months now upon us, you will definitely want to stay safe and sound. For some, driving a boat at night causes intense anxiety. Humans are visual. When it’s dark, we get nervous. Who knows what could happen? Yet, nighttime navigators need not fear. With the correct equipment and decent weather, a night cruise in and our of our Palmetto marina can be safe and enjoyable. The first rule of night boating is to slow down. Even on a moonlit evening, you can’t see nearly as well as during the day. Objects won’t come into view until they are close. If you’re going too fast, you might not be able to avoid a collision. Don’t rush. Take it easy. Navigating around our Palmetto Marina can be tricky, but once you navigate out to the Manatee River. Onboard lighting is tricky when navigating at night. You need backlighting to see your instruments and electronics, and you need an overhead light to read a chart. But once your eyes have adjusted to the dark, too much onboard light can wreck your night vision. With this in mind, most marine electronics allow you to adjust the brightness of the backlighting, and many units also have a “night mode” with a darker background to keep illumination levels to a minimum. Thanks to detailed electronic cartography from C-Map, Navionics, and others, today’s chart plotters show more detail than just your present position. Almost any fixed object above water, such as buoys, jetties, and exposed rocks, show up on the plotter, along with the boat’s relative position to these objects. Chart plotters also indicate water depth, reefs and other submerged objects. Radar (radio detection and ranging) provides sight for you. It shows you what’s out there in the dark and tells you how far away it is. While a chart plotter shows fixed objects, radar can show you almost everything above the water’s surface, including other boats. Marine radar has been around for dozens of years, but today’s radar systems are more refined and easier to use. Boats don’t have headlights, and for good reason. In open water, the light reflecting off waves and mist is often more blinding than beneficial at night. However, there are occasions when a searchlight or spotlight is useful, particularly if you are trying to locate or identify a nearby object. There are three basic types of spotlights — fixed-mount, remote-control searchlights; handhelds with 12-volt plugs; and rechargeable battery-operated handhelds. You can also buy night vision, a technology that amplifies light through a scope. This allows you see as if it were daytime, though everything’s cast in green. For tricky waterways, night vision is extremely useful. The U.S. Coast Guard has long-established light display standards for nighttime navigation. If you know the navigation light patterns, you can identify any type of vessel and its activity, as well as determine where to safely enter and exit a harbor at night. In the end, the most valuable thing to have is multiple sets of eyes and ears when darkness falls. There should be at least two pairs of eyes and ears on the bridge at night. Modern navigation gear is fantastic, but a good lookout is better. Safety is always a top concern in our Palmetto Marina and getting in and out of our marina can help to make your trip that much easier. Marco Rubio paid off his student loans, crawled out of debt and bought a “luxury speedboat” that he’d been pining after. Clearly armed with plenty of cash, Rubio made a series of luxurious purchases, ending with a “splurge” on the 24-foot Edgewater 245CC, a great vehicle for boating around the Miami waters. The 24-foot Edgewater 245CC is great for fishing. But it’s not the luxury yacht that the New York Times was hoping they’d find when he announced the purchase. Meanwhile, with summer approaching, John Kerry is preparing his luxurious motorboat for some ocean action. When he departs Nantucket, however, he did it in a real luxury speedboat: a $7 million luxury yacht that was built in New Zealand and which Kerry docks in Rhode Island instead of Massachusetts in order to avoid $500,000 or so in exise taxes. Kerry’s boat, “Isabel,” which is three times the length of Rubio’s, is 76 feet. The Edwardian-style interior is finished in glossy varnished teak. The vessel can accommodate four guests in two VIP main staterooms with en-suite baths. Also on board are all the bells and whistles a busy politician needs, from WiFi to satellite communications. The yacht is available to charter, if you’re interesting in experiencing the life of John Kerry. Rates start at $45,000 per week. 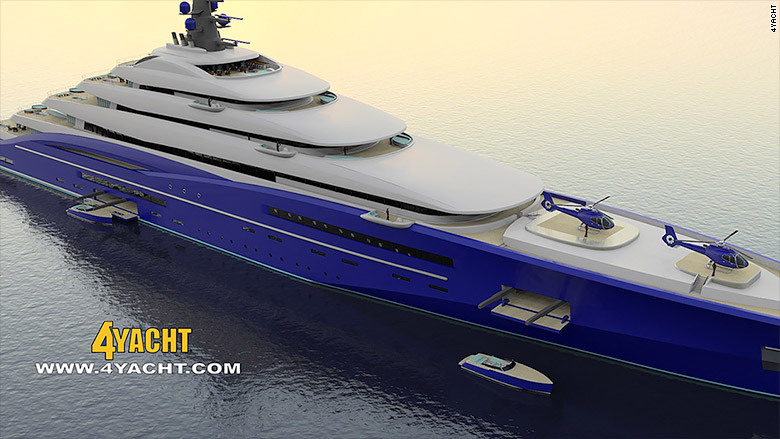 What are your thoughts on the two wealthy individuals boats? Would you ever expect to see those around the Palmetto waters in the near future? Even having them at Riviera Dunes Marina for one day may be a great way to spend a summer afternoon looking at these prized luxury yachts. To start off, the photo above was taken at the Miami Boat Show, on a new powerboat with a robust shore power electrical system. 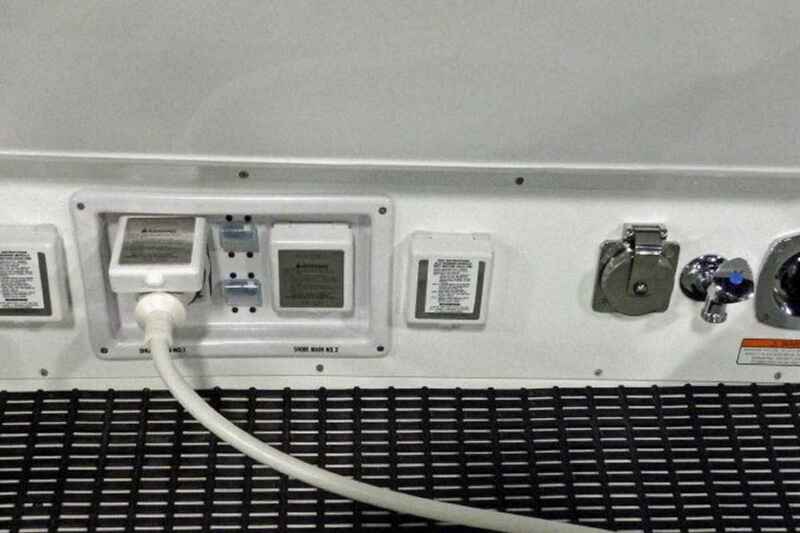 Here you see all of the power inlets located in an enclosure under a lid that was opened to take the picture. If you look to the far right of the picture, you’ll see what looks like a faucet. In reality, it is a faucet! A hose attaches to this faucet, which will probably be the freshwater wash down for this boat. Sometimes the wash down hose hand tightened hose fittings have a tendency of loosening up. This causes water to spray out around the fitting since it gets pressurized. This is easy to fix because you can just re-tighten the fitting every now and then. The downfall here is that the wash down fittings are by electrical connections! It doesn’t seem like the smartest choice. At the end of the day, electricity and water never truly mix. Always be careful when messing with electricity on your Palmetto boat and keep your attention on the task at hand to make sure that everything that is disconnected is turned off and cannot cause any additional issues. Safety is always a top priority for any Palmetto boat owner, but when washing down your vessel, do so with caution. Are you a stickler for a clean boat like we are? What are your tips and tricks to keep it looking brand new? Leave us a comment on our Facebook with your tips so we can spotlight it for everyone to see!